photos (me) | poor scientist. will blog 4 food. About to dig into some spicy and delicious pork stuffs. I’ve finally made it to my FINAL Taiwan post! Whee! Twelve posts later and I’m still 2.5 months behind, but I will be staggering more recent photos (i.e. Thanksgiving) with my Japan posts. I only realized a couple of years ago that a lot of Taiwanese food is fried. Maybe that’s why it’s so delicious! I’m grouping a few meals together in this post. The first photo is from the basement food court of Taipei 101, on the same day my sister and I had afternoon tea. We shared a combo meal featuring some Taiwanese staples, including oyster omelette. The oyster omelette is very interesting because it has eggs and oysters (duh), but also something glutinous (because Taiwanese love chewy stuff) and lettuce. It’s topped with a sweet ketchup based sauce, often in a slightly disturbing shade of fluorescent orange. The second set of photos are from a meal with two of my sisters at a more upscale, Taiwanese restaurant in one of the department stores. Of all of the dishes we had there, I’d say the most authentic/unique was the clay pot filled with pig intestines and pork blood pudding. I know, it sounds awful and disgusting but it’s actually really delicious. You’ll just have to take my word for it! Before I left Taiwan, my mom took me back to the Taipei Train Station Food Court (aka the Largest Food Court in the world) for my last taste of Taiwanese food. We had oyster omelette again, as well as vermicelli noodle soup (only so-so), and a giant fried meat ball, another Taiwanese specialty. It’s basically minced pork, garlic, and bamboo shoot inside a very chewy skin, topped with that same orange sauce as the oyster omelette. When it’s good, it’s SO good, but this one was just ok. Finally, I finish with this great photo of a giant bowl of delicious noodles that cost about $3 and bigger than my nephew’s head! This bowl of noodles is bigger than my nephew’s head. Categories: photos, restaurants, travel | Tags: fried things, noodles, photos (food), photos (me), Taiwan, Taiwanese | Permalink. 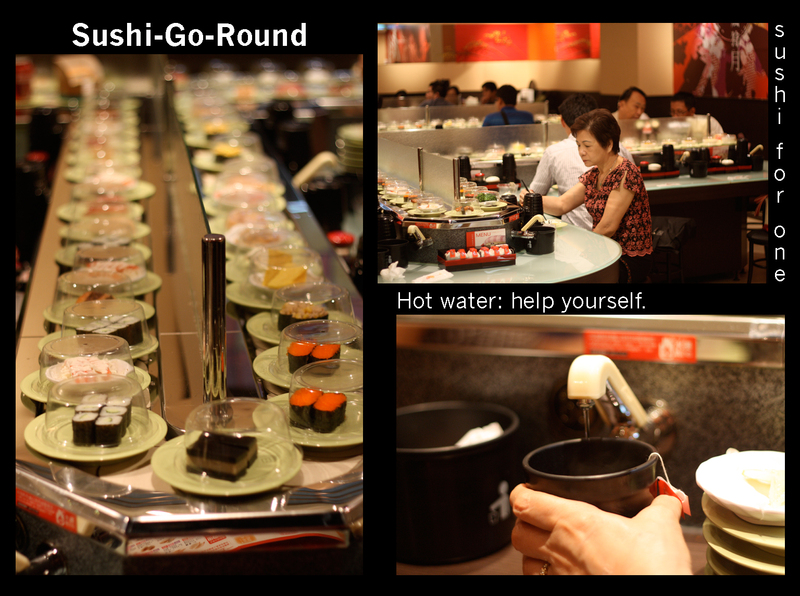 The concept of Sushi-Go-Round/Revolving Sushi is amazing: fast, fresh, healthy, and relatively cheap. Basically, you sit at a bar while plates of nigiri, sashimi, and rolls move past you on a conveyor belt. You grab whatever you feel like eating. At the restaurant that my mom took us to, the plates were $1 each, but at other places, the plates are color coded corresponding to prices. If you don’t see anything you like, there’s also a menu of made-to-order food. The food at this particular sushi-go-round was so-so. 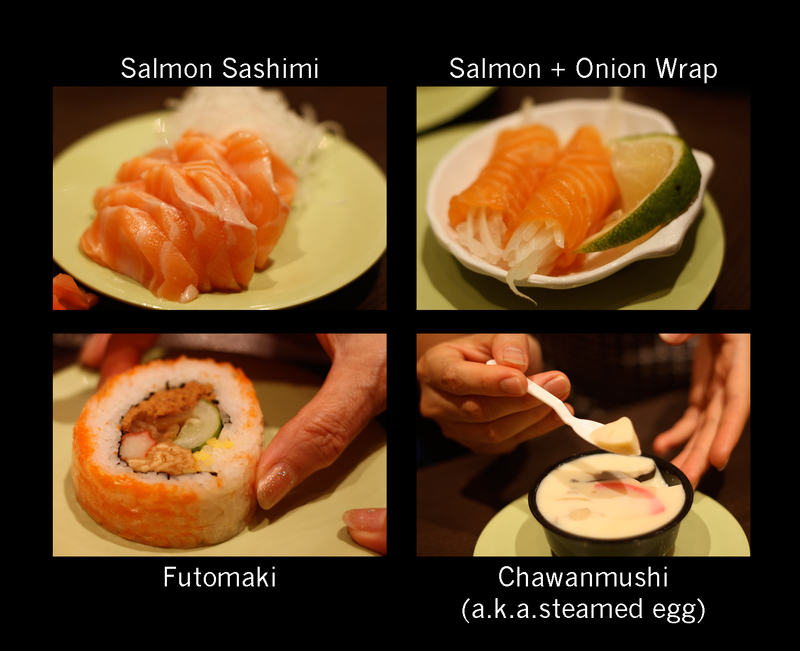 The miso soup was rich and filled with large chunks of fish (sorry no photos) and the salmon nigiri was quite delicious. However, one of my orders (was it tuna? or maybe yellowtail?) was really disappointing. The highlight for me, though, was the design. I loved that there was a water spigot every couple of seats that dispensed hot water for tea, the little trash tub that kept things orderly, and the cute container for chopsticks. My mom never stops trying to feed me. 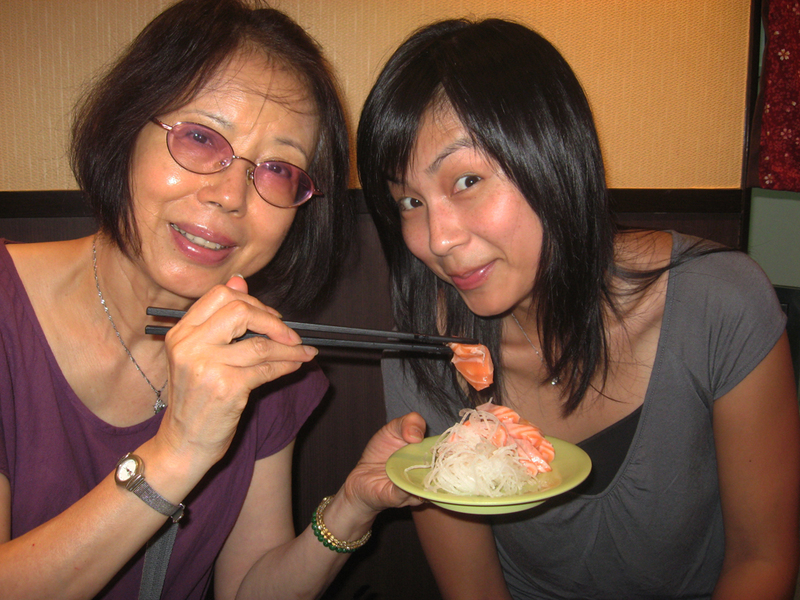 Categories: photos, restaurants, travel | Tags: photos (food), photos (me), sushi, Taiwan | Permalink. One of my major goals for this blog is to bring world-renowned cuisine to my readers whenever possible. One such restaurant is Din Tai Fung, which started out as a small, struggling oil shop in Taipei that sold steamed dumplings as a side business. Since then, it’s opened branches all over the world, expanding to Japan, Hong Kong, Shanghai, Indonesia, Korea, and Los Angeles. Steamed dumplings, or xiaolungbao, ready for eating! What is a steamed dumpling, or xiaolungbao (literally “small steamed basket bun/dumpling”), you might ask? Typically, they are filled with pork, though you can also get them with crab or other meat fillings. The legit places will cook them to order. This means you usually have to wait at least 20 minutes, but boy is it worth it! A good xiaolungbao will have chewy al dente skin and be piping hot in the inside with flavorful pork and pork “soup.” This soup I’m referring to is savory pork stock that comes from the steaming process. Because of this, I prefer the name soup dumplings instead of steamed dumplings. Due to the high liquid content, it’s a good idea to eat xiaolungbao with a soup spoon. It’s tempting, but don’t dunk your steamed dumpling into soy sauce. No, the best way to eat xiaolungbao is with red vinegar and ginger, which brings out the flavor of the pork filling really nicely. Careful, it’s full of hot, delicious liquid! So what sets Din Tai Fung apart from all of the other restaurants serving steamed dumplings? In all honesty, there are plenty of other restaurants in Taipei with comparably delicious xiaolungbao. However, Din Tai Fung is one of those restaurants that provides an “added-value” experience, from the open kitchen where customers can watch the intricate process of dumpling-making, to the friendly and professional service staff. This is why there’s a huge line out the door every weekend, and how they can charge US$1 per tiny dumpling. A side dish of pickled cucumbers, my favorite! Their noodles were also excellent. The broth was clear and light. 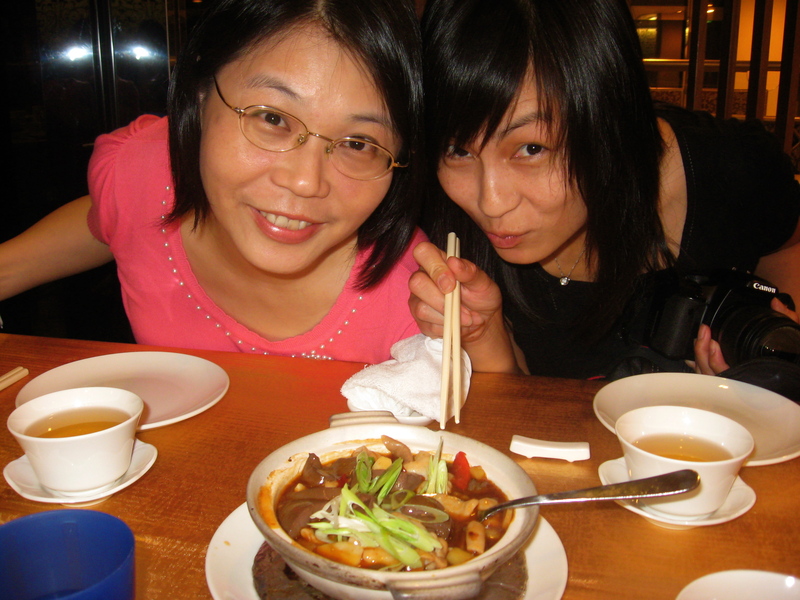 Categories: noodles, photos, restaurants, travel | Tags: dumplings, noodles, photos (food), photos (me), Taiwan | Permalink.